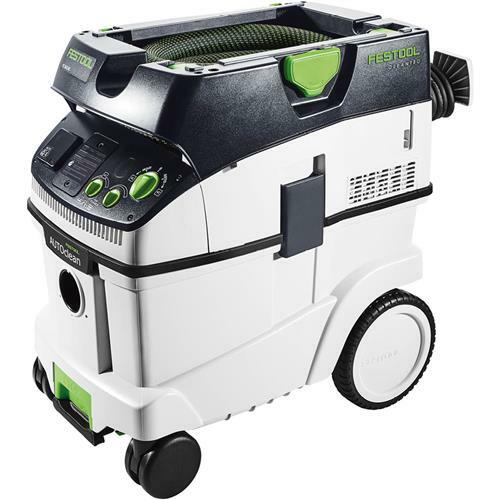 With 137 CFM and a super quiet 62 dB (low setting) the Festool CT 36 AC is a specialty dust extractor designed to the mate with the Planex Drywall Sander. It's nearly 10 gallon capacity is combined with an auto cleaning feature that knocks dust free from the filter ensuring maximum suction throughout the work process. This ensures maximum suction even when collecting very fine dust particles, such as drywall dust. The frequency of the filter cleaning is controlled by a dial and can be turned off allowing the CT 36 AC to be used as a regular dust extractor.Includes a very lightweight specialty, flexible hose for use with the Planex Drywall Sander. Container Bag Capacity: 9.5 gal. Filter Bag Capacity: 8.9 gal. Depth x Width x Height: 24.8" x 14.4" x 23.4"